How to set the right language for search results? Home »	Fix » How to set the right language for search results? Issue: How to set the right language for search results? 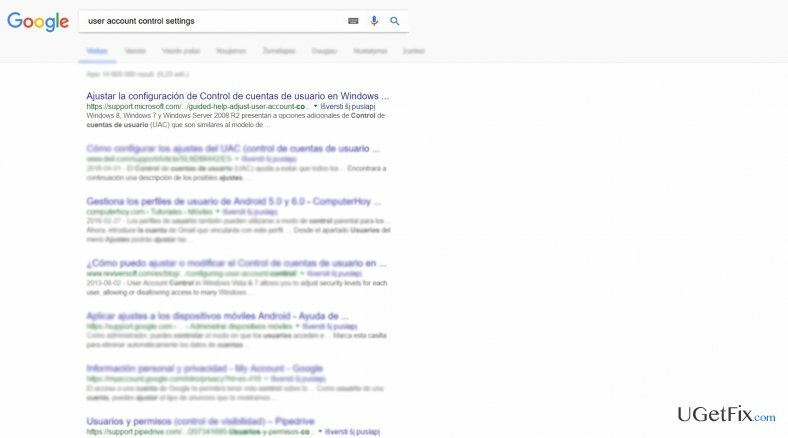 Recently, I keep getting the search results in Spanish. I change the language settings in the browser, but it only solves the problem for a short while. Any ideas for a permanent solution? Navigate to Control Panel, Time & Language > Region & Language settings. Delete all other languages and leave only English. Go to Control Panel, Region > Formats > set it to English (United States). On the same window, click Location tab. Set it properly. Now choose Administrative tab. Opt for Change system locale..., set it to English (United States). Under Administrative tab, click Copy settings…. Make sure Welcome screen and system accounts and New user accounts bars are checked. Complete the action by clicking OK.
Before proceeding further, it would be better to reset the browser settings in the first place. If you are using Chrome, enter the Settings by clicking on three vertical dots. Then expand the Advanced browser settings indicated below. Find the Languages section. Choose the preferred language as the default one. Note. This problem might be prevalent only to one type of browser. If search results are delivered in the right language after you sign out or use an alternative browser, reset the browser settings. Open Internet Explorer, click on the Gear icon (IE menu) on the top right corner and select Manage Add-ons. Then look for any suspicious plugins. Disable them. Change your homepage if it was altered. There, remove unknown URLs and enter a preferable web domain name. Finish the action by clicking Apply. Click on the gear icon (menu) again and navigate to Internet Options. Enter to Advanced tab. In a new window, check Delete personal settings and choose Reset. Click on three vertical dots in the top right corner of the browser. Select Tools > Extensions. Find unknown malicious plugins and select trash icon to delete these entries. Revert your homepage to the previous one. Find Open a specific page or set of pages under On startup option and click on Set pages. Remove questionable search sites and enter the one that you want to use as your homepage. Near the Settings option, navigate to Manage Search engines. Remove malicious search sites. Leave only Google as the default search provider. After you enter Settings, scroll down to the end of the page and click on Reset browser settings. Finally, we recommend you scanning your system with an anti-spyware application, e.g. Reimage, once in a while.